Budapest, including the Banks of the Danube, the Buda Castle Quarter and Andrássy Avenue, holds a number of influential constructions from the Middle Ages to the late 19th century. This holds the city's medieval sites, with Buda Castle. Also there are the remains of the original Roman town Aquincum. This includes the Parliament (1884-1904) and the suspension bridge (1849). The extension with Andrássy Avenue in the year 2000 included the Opera, Millennium Park and the Underground Railway. Budapest used to be three cities, Buda, Obuda and Pest, and nowadays is a big city to explore. The first morning I made the mistake to try and cover it all on foot, but by using the effective underground and streetcar system you can spare your feet. The Castle Quarter in Buda is the most touristy part. It has the usual overpriced restaurants, but also some pretty sights. It wasn't too crowded, nothing like the madness I experienced in Prague or Florence. On the other side of the Danube, in Pest, more recent monuments can be found. The Parliament looks a lot like its English counterpart. Most of the buildings along Andrássy Avenue also date from the 19th century. I couldn't find exact information on which of the many monuments in Budapest's city center are included in this World Heritage Site. 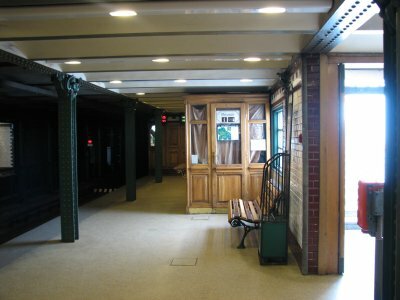 The oldest underground railway on the European continent is (the oldest in the world, London, however isn't! ), but the largest Synagogue in Europe is not (as far as I can make out). There are too many interesting places to choose from in this city well worth visiting, and by far I didn't see them all during my 3-day stay. 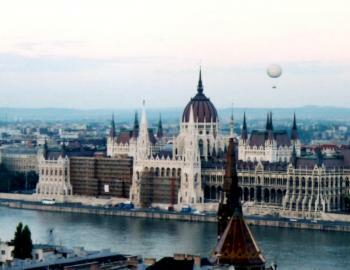 Budapest was my first foray into Eastern Europe beyond Russia, and it was an unforgettable city. I traveled to the city by train from Vienna with family and friends in the fall of 2003, and was thus able to consecutively visit both capitals of the former Austro-Hungarian Empire. We stayed on the Buda side of the city, west of the Danube, where we spent much of the first day exploring the heights of the Buda Castle district. I particularly enjoyed Matthias church and the glorious view of the Danube from Fisherman's Bastion, an unforgettable overlook. 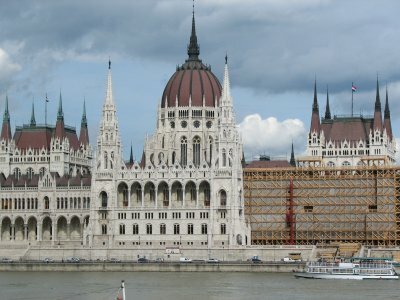 Directly across from the river on the east bank of the Danube is the amazing Hungarian Parliament Building; this view is featured prominently in American advertisements of European river cruises. Just as spectacular are the views of the bridges, which are brightly lit at night. While on the Buda side, we also enjoyed visiting the cave church in Gellért Hill, near the Gellért Baths. Across the river on the Pest side was the impressive Great Market Hall, the grand boulevard of Andrássy Avenue, and the Dohány Street Synagogue, the largest synagogue in Europe. There is almost too much to see in Budapest in just one weekend visit, and I would gladly return to spend more time in this great European capital. Logistics: Budapest can be easily navigated by foot or by public transportation, including a subway, trams, and buses. There is also a funicular on Budapest Castle Hill, connecting the castle with the Széchenyi Chain Bridge below. Budapest's entry on the WHS list encompasses a wide territory. I went to all three sections (the Banks of the Danube, the Buda Castle Quarter, and Andrassy Avenue). My visit was in February of this year. The banks of the Danube are gorgeous. It's impossible not to be awed seeing the Parliament at night on the river. I did a night cruise, and I would highly recommend it. Andrassy Avenue was a great street to walk down in the afternoon. The Terror House Museum, while not officially part of the inscribed territory, was one of my favorite parts of Budapest. I visited this WHS in September 2012. Budapest is a great city with a lot of interesting sights to see along the Danube river. The highlight of my visit was the Hungarian Parliament which took 20 years to build but is a masterpiece. Close after were the Szechenyi Baths and Spa with indoor and outdoor wellness treatments. Watching the locals play chess on a floating chessboard in the 38 degrees pool was priceless! I visited Budapest in May 2011, and was mesmerised by the city and its beautiful architecture .Both the Buda and Pest have their very own distinctive style of architecture.We could see the Palace ,the Chain bridge and the Danube lit up,stunningly beautiful at night ,from our hotel room. The walk on the banks of Danube is delightful ,with old women sitting on benches selling Hand embroidered tablecloth and runners.Walked up to the shoes on the banks of Danube ,then up to chin bridge ,crossed over to Buda side and had a view of the Funicular or the single compartment train which takes one up to Buda castle .Did not take it though but walked up to the palace. The castle is splendid ,and saw preparations for the horse show being arranged there. Walked onwards on the cobblestone streets to Trinity square , Mathias Church with its lovely Rococco roof which can be seen from our hotel too,then on to Fisherman's Bastion and stood there to get an absolutely magnificent view of the River and The Pest side of the city. The next evening we walked in the opposite direction passing the statue of the little boy ,(or is princess?) 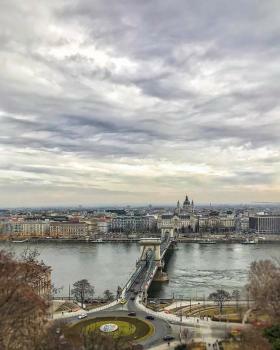 crossed the Danube at the Elizebeth Bridge(named for the most popular Queen Sisi ) to reach Gellert hill ,trekked up to the Libertion Monument and The Citadel a fortress from which we got another panoramic view of the city . But before the walk to Gellert hill,we had had a tour of Buda in the morning ,walking down the Danube to The magnificent Parliament building and St Stephen's cathedral . We were taken along the Andrassy Avenue to Heroes square , passing the House of Terror enroute. Of course Budapest has more to see,the Hungarian Agriculture Museum and its statue of Anonymus,the City Park , the Szechenyi bath ,though we did not have time to go there ,The Farmers market and the long exclusive shopping promenade "Vaci Utca" . Budapest is a nice city. I have spent over a year studying in this city and although some aspects are not really satisfied (like the public transport), it is still an attractive city. In all European cities that I have visited, only Vienna gave me a better impression. Besides, the Hungarian are hospitable although not every people in Budapest can speak English. It was a funny experience for me when one guy tried to tell me the way but he only spoke Magyar and I didn't understand a single word. Budapest is one of the most beautiful cities I have visited. The Danube promenade fortunately is not as crowded as in the banks of Seine (in Paris) and Rhone (in Lyon). Photo enthusiasts will need to stay at least one full day; Budapest is beautiful during day time and more stunning at night. Around 11pm, the lights are turned off. I plan to go back in the future and discover more places. Hungarians are very hospitable, too! 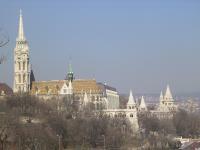 I love Budapest and went there several times during my long stay in Vienna (it is only three hours by train). So much has already been said in praise of this magnificent city that I would only like to emphasize some sites which gained my speical interest. I am usually not a great fond of spas but visiting Budapest should certainly include such an experience. Alongside the Danube you find the Rudas Bath which is a beautiful traditional stone bath and the Gellert Bath which is one of the prettiest Jugendstil pieces of architecture I've ever seen. Buda Castle is home to two museums. I would recommend the Hungarian Gallery. Next to it you can visit St Matthew Church which is not only impressive but is practically one of the strangest churches I've ever been to. It has a unique style I saw nowhere else. Across the street there is a marzipan museum in a coffee house where you can also enjoy traditional Hungarian cakes. On the opposite side of the Danube don't miss the Liszt Music Academy. It is an amazing building and is situated near the best restaurants in town (and just a hundred meters from Andrassy Avenue). At the Hero Square there is the Museum of Arts (not to be confused with the Hungarian Gallery which only houses Hungarian art). Its greatest virtue is its El Greco collection. Non Unesco sites: the new Holocaust museum is architectonically very interesting and the Sculpture Park is where the Hungarians put removed colossal monuments of Communist Budapest together. Most inspiring. Budapest is just great. I was there in May 2003. 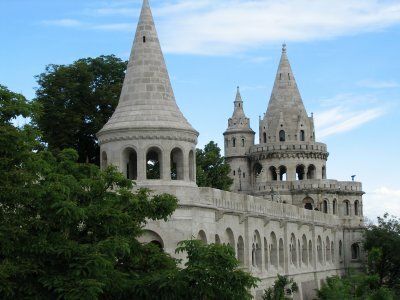 I spent a day exploring Castle Hill and Fishermans Bastion. a place in my heart because of my Hungarian heritage. Budapest is a very grand city, and is definately worth a visit. You need patience because the transport system can be frustrating at times, but it will pay dividends. A trip into Budapest down the Danube is a wonderful experience, and as Ian said below the parliament building is probably only second to the Houses of Parliament in London in impressiveness. This gem on the banks of the Danube are a travellers dream. A favorable exchange rate, convenient forms of mass transit, and an overall Eastern European flavor, made Budapest one of my fondest surprises. The parks are lovely and the city is much greener than I had imagined. A great few day stop or full blown destination. Of my experience, Budapest stands as the most "urban" of the major cities of Eastern Europe. It has been labelled the "Paris of the East," and the epithet is not unmerited. Grand architecture abounds along Andrassy Avenue, leading you to the suitably showy Heroes Square and the central park of Budapest. The city, essentially divided in two between Buda on the west of the Danube and Pest on the east, is a city of contrasts. On the Pest side, one can see the city evolving as tourism and capitalism begin to push Budapest into the 21st century; the Market Hall is sufficient evidence to know that Hungary has embraced Western economic ideals to their fullest extent. Meanwhile, the Buda side, with its beautiful Castle and Gellert Hills, exists in a seeming time warp in which the passage of years has little meaning. St. Mattias Church and the Citadel, on the respective hills, attract visitors for their fabulous views and their particular relevance to the architecture of the period in which they were built. Budapest is very much a city on the rise; stray from the tourist routes and explore the seemy underbelly of this urban renaissance project, you will not be disappointed in what you find. Budapest is one of Europe's great cities, in my opinion nicer than Prague (which is still beautiful). The panorama of the Danube especially, with the magnificent Parliament on the one - the Pest, or new town side - and the Castle Quarter with its scores of interesting buildings on the other, the Buda or old town side, is simply a great sight to behold. Also the inner city with the Andrassy Boulevard is a wonderful area for a stroll. Budapest is of course very easy to reach from Austria, and a popular weekend destination, but if you have the chance to see the city, even if you are from further away, you should do so. Budapest has quite a broad central area and the UNESCO site covers most of it so there is a lot to keep you occupied whilst you are there, well worth a long weekend. 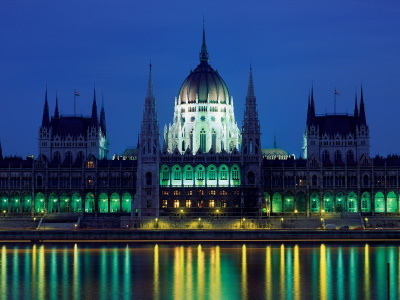 The Parliament building is perhaps the best in Europe after London, the two are very similar in many ways from the intricate neo-Gothic architecture to their riverside location. The Danube is a key part of the city and the banks offer the best views especially to the other side with Buda Castle, which is also a fantastic ensemble, it was from he riverside that we saw Hungary confirm its entry into the EU and were given a really fantastic firework display for it, hence the pictures! The Danube also gives the city some of its most distintive features especially the Chain Bridge. Further out Andrassy Avenue is a large boulevard that runs up away from the river side centre up to the large parks. The Cathedral of St Stevens is well worth a visit it is huge and is just recently renovated inside, a real highlight. Oh and as a tip the best views over the banks especially down onto the Pest side are from the Citadel and once you have hiked up and down, it is well worth popping into the famous Gellert Spa at its base for a much needed and reasonably price bout of relaxation in sumptuous surroundings! From "Budapest, the Banks of the Danube and the Buda Castle Quarter" to "Budapest, including the Banks of the Danube, the Buda Castle Quarter and Andrássy Avenue"
Zero Mile or Kilometer Markers: Is located at Clark ?d?m t?r (Adam Clark square), at the Buda abutment of Chain Bridge, below Buda Castle. It is marked by a 3m high limestone sculpture. Hospitals: "Hospital in the Rock" WWII hospital built into the caves under Buda Castle. Used later during the 56 rebellion and as a nuclear bunker. Siemens AG: Siemens AG built the Millenium Underground. Queens and Empresses: Habsburg Empress Maria Theresa built the Buda Castle as the symbol of peace and friendship between the dynasty and the Magyar. Legends and Folk Myths: Gellert Hill - St. Gerard (Gellert) was killed by the pagans during the great pagan rebellion in 1046. He was put in a barrel and rolled down into the deep from the top of the hill. 597 Community Members have visited.